Cancer is ruled by the moon. It’s the sign of the zodiac which is related to the breasts and the feeling and emotions in our hearts. Cancer is in many ways, the most sensitive and vulnerable sign in the zodiac. They feel very deeply, but they’re not sure of what to do about their feelings. The moon is a part of us that is just innocent and wants to feel good. We don’t really know what to do when we don’t feel good. What we should “do” is “nothing”. We should just sit with what is. Instead we reach out from a place of confusion, usually involving others in our drama – in an attempt to feel better .. 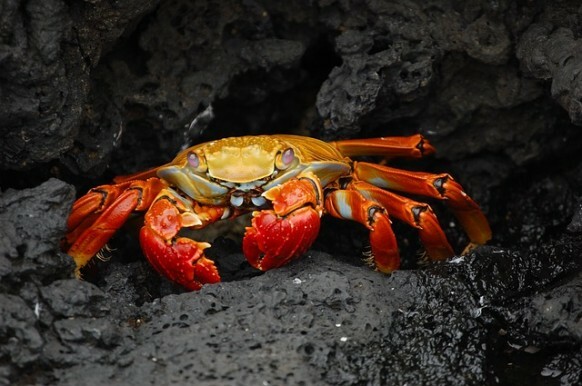 The Crab – KatakaWe reach out into the world to try to feel some sort of peace and connection. And usually, we just create some sort of stress, clinging, longing and emotion. At best we may satisfy our desire in the moment to feel more peaceful, but we are often creating a lot of attachments that are painful. The sign of Cancer exhibits a lot of these traits. The person will feel others emotions very powerfully, and their emotions overwhelm them pretty much all the time. Every day they feel a little different, and they’re not sure how they’re going to feel one day to the next. They would like to merge and flow with everything, but when they try to do that they realize others do not want to merge and flow with them. And in fact, there’s a lot of illusions around this. They tend to feel like they love everything and everyone, but it’s impossible to maintain because love of adults is reciprocal. It must be reciprocated. The love of Cancer is actually the selfless love of the mother, and that’s the only correct expression. Cancer love is that selfless love that a mother has for a child, that love that is not based on any kind of reciprocation. So, Cancer people are excellent mothers. They’re excellent with nurturing others and wanting to feed others and give selfless love, but they are often very emotional, difficult to understand and even emotionally demanding. Once they become attached to an idea or feeling toward a person, they want it to be reciprocated, and when it’s not, they can be very emotionally passive-aggressive and play emotional games to try to get attention, validation etc. Cancer must learn to base decisions on things other than just their emotions. There are very few things in life where we need to make emotional decisions, and the Cancer person needs to learn to be more practical and rational about situations and realistic about themselves and others.